Much of the news cycle on Friday morning was consumed with allegations by Donna Brazile against the Democratic National Committee. 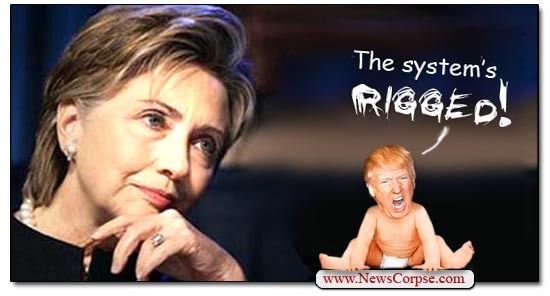 Her charges that the DNC “rigged” the primaries in favor of Hillary Clinton were lustily embraced by Republicans, Fox News, and Donald Trump. The debate over her account of the events will likely go on for days. And rather than contribute to the noise, I’ll just leave this brilliant Twitter thread by Joy Reid to explain things. Donna Brazile just stated the DNC RIGGED the system to illegally steal the Primary from Bernie Sanders. Bought and paid for by Crooked H…. That’s a Trump lie. Actually, Brazile explicitly said that the funding arrangement “was not illegal, but it sure looked unethical.” So in fact, it’s two Trump lies. There is nothing illegal about what the DNC did, and Brazile never said there was. ….This is real collusion and dishonesty. Major violation of Campaign Finance Laws and Money Laundering – where is our Justice Department? Here Trump is trying to re-purpose the word “collusion” to take the heat off of himself for having colluded with Russia to illegally steal the election. No campaign finance or money laundering laws were broken by anyone but Trump. However, with this tweet he begins his obvious signals to his Justice Department minions. Everybody is asking why the Justice Department (and FBI) isn't looking into all of the dishonesty going on with Crooked Hillary & the Dems..
Trump and his cronies at Fox News are the only ones asking about this. And here he continues waving at the DoJ. Having provided zero evidence of any crime, Trump brings up a bunch of other crazy and debunked conspiracy theories in hopes that something will stick to the wall (that Mexico isn’t paying for). ….People are angry. At some point the Justice Department, and the FBI, must do what is right and proper. The American public deserves it! Well, Trump is sure angry. But polls show that most other Americans support Robert Mueller’s investigation and believe that Trump committed crimes. And he’s still putting pressure on his Attorney General to prosecute something that isn’t illegal. The real story on Collusion is in Donna B's new book. Crooked Hillary bought the DNC & then stole the Democratic Primary from Crazy Bernie! Now Trump is just repeating himself like the old dotard that he is. And just because he’s a infantile jackass, he throws in an insult to Bernie Sanders. Because racist insults play so well with his idiot base, he lobs one Sen. Elizabeth Warren. And he makes another plea to persecute his former political opponent, like all good tyrants do. Bernie Sanders supporters have every right to be apoplectic of the complete theft of the Dem primary by Crooked Hillary! Trump’s comments are those of a deeply disturbed individual. Trump appears to be suffering from acute dementia mixed with a dangerous portion of Malignant Narcissism. His multiple calls for prosecution of a political opponent reek of authoritarian power madness. And his total lack of knowledge of the law only exacerbates the potential harm he is capable of. What’s more, he has no sense of the ethical restraints a president has with respect to the independence of the Justice Department and law enforcement. He only thinks of himself and what he wants. He said precisely that to Laura Ingraham on Fox News Thursday night. She asked about the numerous vacancies in his administration (which portend great risks to the nation). His typically egocentric response was that it doesn’t matter because “I’m the only one that matters.” Good f**king grief. Perverse fetish? You mean misogyny, insecurity, feelings of inferiority to someone obviously your intellectual superior, jealousy, envy, hatred and yes, everything that you said in your article. When is America going to be tired of talking about Trump, the Liar in Chief, day in and day out from morning until night? Trump is not the only one with a “perverse fetish,” The white media, pundits, politicians and at least 75% of white Americans love him or hate him, can’t get enough of trump on a daily basis. He is like a drug for white Americans- they need it- meaning trumpworld- but know that its not good for them, BUT they need to talktrump ALL DAY EVERYDAY. When is enough really enough and then he is shown the door? I hope H R Clinton has bodyguards 24/7 because Trump and his followers are CRAZY misogynists. When is the gop going to wake up and realize that their fools golden boy is very very sick mentally ? Traitor trump spouts off and screams at anything he doesn’t like. His ego is unbounded. He needs to be removed to a mental institution as quickly as possible. All I can say is I weep for this nation. We are in the midst of a full blown national crisis and the Republicans do nothing! Shame on them!